COLORADO SPRINGS, June 28 /Christian Newswire/ -- Compassion International, the Christian child advocacy ministry, announced today at the International Christian Retail Show in St. Louis the most recent release from its publishing arm, "UnPoverty: Rich Lessons from the Working Poor." "UnPoverty" is the first book by Mark Lutz, an executive with Opportunity International, a microfinance ministry. He has worked in international development for 23 years and lived 18 years in South Africa with his missionary parents. "Like Mark, I grew up in Africa among the poor," said Wess Stafford, Compassion International president. "We both saw our African friends suffer and even die from the ravages of poverty. And most never reached their full potential. We have much to learn from the poor, and this book affords us a glimpse into their insights." "In this poignant book, the quiet lives of voiceless people struggling to survive on the margins speak out powerfully…'UnPoverty' is a treasure of inspiration and encouragement for those who desire to make a difference in their world," said Bob Lupton, founder and president of FCS Urban Ministries. In "UnPoverty," the author introduces readers to their neighbors around the world. The book's 11 chapters have simple titles, such as "Self Reliance," "Community," "Awareness," "Ingenuity" and "Gratitude." Each chapter relates a rich lesson Lutz has learned from poor people. The lessons are illustrated by one or more of the heroes Lutz has met in the developing world. These poor people have transformed their lives, demonstrating that change is possible. Lutz's hope is that their examples inspire more people to get involved. According to Lutz, half of humanity lives on two dollars a day. "Though materially poor, they are rich where many in the U.S. are bankrupt," he said. "If we knew them as individuals, they would edify us, deepening our understanding and respect for them. "We can envision a world during our lifetime where extreme poverty is replaced with dignity and modest prosperity for all, and in the process, those who are materially affluent become more whole," Lutz said. Lutz is contributing royalties from sales of the book to international charities that relieve poverty. Likewise, he encourages readers to donate to proven charities as well. To that end, "UnPoverty" offers a full page of pertinent information on each of eight ministries that significantly impact the lives of the poor: Compassion International, Habitat for Humanity International, Heifer International, International Justice Mission, Living Water International, MAP International, Opportunity International and World Relief. 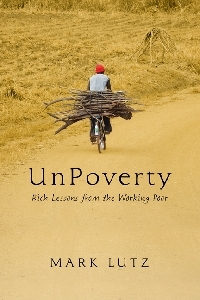 "UnPoverty: Rich Lessons from the Working Poor," which will be distributed by Wesscott Marketing, is available at www.wesscottmarketing.com or by calling (800) 375-3702. The cost is $20.99 for hardback and $14.99 for paperback. The hardcover book includes a CD of songs by Joshua Lutz, the author's son, illustrating each chapter. Compassion International exists as a Christian child advocacy ministry that releases children from spiritual, economic, social and physical poverty and enables them to become responsible, fulfilled Christian adults. Founded by the Rev. Everett Swanson in 1952, Compassion began providing Korean War orphans with food, shelter, education and health care, as well as Christian training. Today, Compassion helps more than 1 million children in 26 countries. To schedule an interview with Mark Lutz, contact Gregg Wooding at (972) 567-7660 or gregg@inchristcommunications.com.